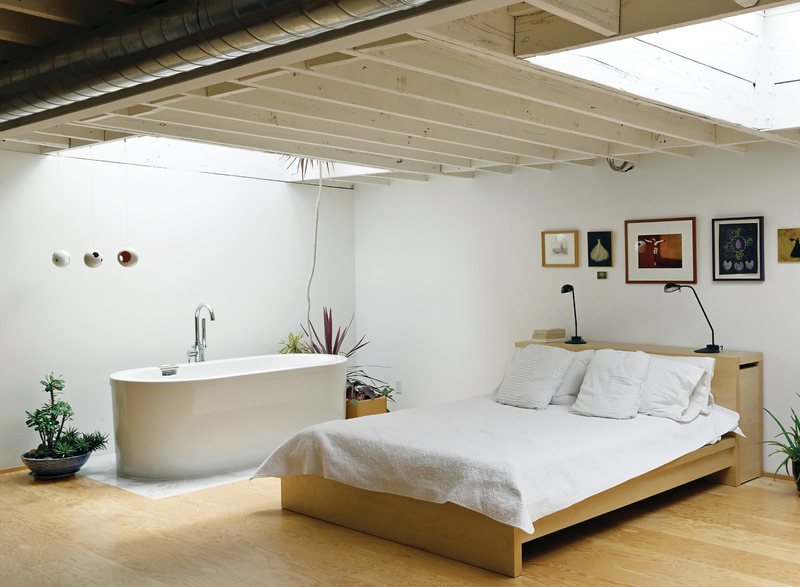 In a Toronto live/work studio, the bedroom mixes a bed and lamps from IKEA with a deep, luxurious bathtub (an inexpensive model from Neptune). For this tiny apartment renovation in Melbourne, the bathroom was creatively composed using inexpensive Quarella Calacatta floor tiles, a Villery & Boch wall-mounted sink, and a Reece Sabine bath. Brass electroplated fixtures and FLOS Mini Glo Ball wall lights add a touch of sass to an otherwise understated space. In this Delaware bathroom, Italian Calacatta Gold marble tiles match an equally pristine Duravit bathtub. Vola fittings were installed in the shower. In this industrial loft renovation in Brooklyn, the bathroom features a pattern of gray and turquoise tiles that climbs from the floors up the walls. They serve as a burst of color among the predominately white walls elsewhere, transforming the bathroom into one of the apartment’s most striking spaces. In a renovated Montreal duplex, a freestanding bathtub sits beneath a skylight that runs the width of the room. A large mirror hangs above the vanity, which is outfitted with a butcher-block countertop. Black mosaic tiles were used on the floor. Photo by Matthew Williams. Image courtesy of matthew williams.